In 2011, youth movements around the world confronted dictators, demanded economic opportunity, and fought for political inclusivity. Young activists on the front lines of protest movements from Egypt to Chile made international headlines and challenged the status quo. But youth are not only agents of change; they are also their country’s economic and political future. As Babatunde Gabriel Oladosu of Nigeria, 2nd place winner in the CIPE Youth Essay Contest 2011 Economically-Sustainable Development category wrote, “I believe Nigeria’s greatest wealth is not its 260 trillion cubic feet of natural gas or massive agricultural potentials; but the over 100 million youth it will have in 2020.” This is true not just for Nigeria. Burgeoning youth populations from India to Ghana to Guatemala make it all the more important to engage young citizens in building democracies that deliver. This week, CIPE celebrates winners of the CIPE Youth Essay Contest 2011 and all other youth that are engaged in strengthening democracy across the globe. 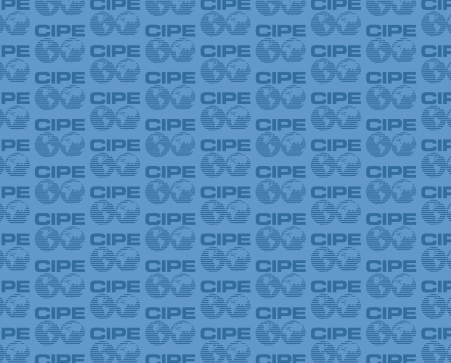 This blog is the first in a three part series of interviews with the 2011 winners and will highlight winners’ backgrounds and why they participated in the CIPE Youth Essay Contest. The three categories this year were Corruption, Democratic Transitions, and Economically-Sustainable Development. What sparked your initial decision to participate in the CIPE Youth Essay Contest, and how did you choose your topic? Part two and three in the series will respectively highlight how winners’ home governments can be more inclusive towards youth, and what the winners would like to learn from their peers around the world. In their rush to create justifications for reducing the footprint of government on the economy (and society), economists have invented a number of new “approaches” to economic development, unemployment and poverty which rely on an increased private sector presence. Concepts such as social entrepreneurship and new regionalism emerged as the governments embraced the so-called Third Way – neither free market (right) or government regulation (left) – as a way to resolve unemployment and regional disadvantage. Microcredit was another version and the 2006 Nobel Prize was awarded to the Grameen Bank in Bangladesh and its founder. The media held microcredit out in various positive ways but gave the impression that it was another solution. Insiders knew it wasn’t but the I have always argued that the best solution for poverty is to initially create decent paying jobs. I have also argued for many years that only the national government has the capacity to really intervene in this way. For it is was “profitable” in the free market sense, the private sector would have already done it. It is clear that when we are dealing with the “highly marginalized ultra poor” who live “hand-to-mouth on meager wages from manual labor or by stretching subsistence farming income for months between harvests … it is extremely difficult to use loans for anything other than meeting their most basic food and healthcare needs”. Similarly, the responses from the various international efforts (such as the GAP-Ford Foundation Graduation Program) still consider that “micro-entrepreneurship” is the solution. These models consider the ultra-poor have to first undertake a lengthy (supported) rehabilitation prior to engaging in work proper and skill development. Analysts claim that the problem is one of scale – there are simply too many people in need of support and governments cannot afford to provide the required level of real resource assistance (food, clothing, shelter etc) while the ultra-poor are being rehabilitated and prepared for training and “productive” employment. It is clearly important that people break their dependency on welfare by gaining employment and therefore gaining access to stable incomes which allows them to risk manage their own lives. But while fast-tracking the individuals into paid-work will reduce the nominal outlays that government might make in the “rehabilitation” phase these hybrid approaches still miss the point. The problem is one of scale. There are too many people in need for these “market-based” efforts to succeed when aggregate demand is deficient. Once again it is the problem of looking at an issue from a microeconomic lens and thinking that what might “work” at the individual level will translate to a macroeconomic solution. How will all these new business survive if there is still insufficient aggregate demand quite apart from whether the new owners have developed the capacity to actually run their new enterprises effectively? The WSJ article quoted Dr. Aneel Karnani who is a professor of strategy at the University of Michigan. He appears to come from a management rather than an economics background. I recall reading an interesting paper in 2007 from him – Employment, not Microcredit, is the Solution. The WSJ article says that Dr. Karnani “has been a particularly vocal advocate for a “jobs first” approach to poverty alleviation” which runs counter to the views held by the international agencies which help fund these initiatives. They claim that the “graduation approach” is necessary to impart “life skills and allows recipients to manage their households as much as it improves their ability to earn a living”. My own view (based upon some experience) is that creating jobs is an important step for a household. I however do not agree with the WSJ article author who says that if we find that “steady employment – not micro-enterprise — really be the first step toward self-sufficiency for hundreds of millions of extremely poor families … [then] … we must do everything we can to create an environment that nurtures businesses with the potential to create jobs and provide affordable services for these families”. I consider that approach will be a partial solution only. Private businesses have a different way of viewing success and many will fail in their infancy. It is not a viable model for solving the joblessness and poverty of millions, especially where public infrastructure urgently needs developing. Aneel Karnani’s paper (mentioned above) is interesting because it challenges the notion that microcredit creates a “virtuous circle of ‘low income, injection of credit, investment, more income, more savings, more investment, more income'” which led the United Nations to designate “2005 as the International year of Microcredit”. … microcredit does yield some non-economic benefits, but that it does not significantly alleviate poverty. The best way to eradicate poverty is help create jobs and increase productivity. The non-economic benefits include improved “self-esteem and social cohesion” especially as empowering sources for women, although the evidence is that in strongly “patriarchal systems of control at household and community levels” this empowerment is marginal. This is the conclusion that we draw when evaluating all these “Third Way” approaches. Some benefits but limited and certainly not sufficient to deal with the scale of the problems being confronted. .. the vast majority of microcredit clients are caught in subsistence activities with no prospect of competitive advantage. The self-employed poor usually have no specialized skills and often practice multiple occupations. Many of these businesses operate at too small a scale. The median business operated by the poor has no paid staff; most of these businesses have very few assets as well. With low skills, little capital and no scale economies, these businesses operate in arenas with low entry barriers and too much competition; they have low productivity and lead to meager earnings that cannot lift their owners out of poverty. Which is entirely predictable and would apply to small start-up loans to businesses in advanced nations equally. When around 90 per cent of the workforce in advanced nations are employees, why would we expect the poor in developing countries to suddenly be successful entrepreneurs? The difference is not whether funding is available or not. Aneel Karnani says that most microcredit clients “are not microentrepreneurs by choice and would gladly take a factory job at reasonable wages if possible. We should not romanticize the idea of the ‘poor as entrepreneurs'”. Creating opportunities for steady employment at reasonable wages is the best way to take people out of poverty. Which resonates with the ILO mantra that “nothing is more fundamental to poverty reduction than employment”. Aneel Karnani provides evidence showing “the pattern of poverty and employment over time in China, India and Africa (which together account for about three-quarters of the poor in the world)”. It shows that where employment has expanded the most (China) the “the incidence of poverty has declined significantly” compared say to Africa “where the incidence of poverty has remained unchanged, a small and shrinking fraction of the population is employed”. This is not to say that employment is the “silver bullet” out of poverty – the rising incidence of the working poor is evidence of that. A job has to dimensions – hours of work and a pay rate. Pay has to be sufficient to “enable the employees to rise above poverty”. My work in say South Africa between 2007-2008 evaluating their Expanded Public Works Program for the ILO demonstrated this point to me. The EPWP employed 1 million people in its first 5 years and has more ambitious targets in the second five year period. The lesson was that poverty rates fell dramatically for those offered jobs within the program. Public amenities and infrastructure were constructed as well as incomes to the workers paid. The program didn’t pay enough nor provide enough jobs but the evidence that the lives of those who did get the jobs improved significantly. Please read my blog – Employment guarantees in developing countries – for more discussion on this point and other programs of a similar nature. The EPWP was constrained because the South African government was dominated by its Treasury which, in turn, was dominated by neo-liberal ideology. It was a very interesting experience discussing economics with their top officials. They seemed to think that the country could not afford to employ the 12 million or so that were in dire poverty and who needed incomes. This is one of the richest natural resource nations around and had all the resources necessary to alleviate poverty. They told me it would cost too much – to which I asked them how a nominal entry into a budget account ledger was a cost. They were unable to deal with interrogation at that level. Aneel Karnani’s paper gets to the heart of the problem. In recent years, the political ideology of the world has shifted decisively towards an increased role for markets and a correspondingly decreased role for the state. But, the role of the state has certainly not been eliminated, nor should it be. The state is responsible for basic education, public health, water, sanitation, public safety and infrastructure. The government in every developing country certainly professes to accept responsibility for these traditional functions. Yet, it has failed dismally to deliver on its promises. The IMF, the World Bank and other agencies have beaten sovereign governments into submission and infused neo-liberal ideology into their operations. Poverty is the result of the failure of the public sector to fulfill its responsibilities to advance public purpose. The “boom in the private sector has been accompanied by a significant failure of the state” and it is the poor that disproportionately bear the burden of this failure (in particular, women). He says that it is an inescapable fact that “(c)reating employment and increasing productivity is the best solution to poverty” and that it is “the role of the government in providing basic public services, which have a direct and significant impact on productivity”. The two facts combine to suggest that public sector job creation should be elevated as a policy priority. While the challenges facing the less developed countries are massive relative to those facing the unemployed in the advanced world the perpetuation of the crisis is blurring some of those boundaries. The Great Depression taught us that capitalist economies are prone to lengthy periods of unemployment without government intervention. From 1945 until 1975, governments used fiscal and monetary policy to maintain levels of overall spending sufficient to generate employment growth in line with labour force growth. The maintenance of true full employment in most countries also was associated with declining inequalities. Most of the work generated was full-time and real wages grew in line with labour productivity. For those who slipped through the gaps in the distribution system there was a strong supportive welfare state. The advanced economies grew at much more higher rates of growth than they have exhibited in the neo-liberal era. The period since the the commitment to maintain full employment was abandoned by governments after the 1974 OPEC oil price shocks has been marked by persistently high unemployment and rising underemployment which put pressures on the welfare services provision and has been exacerbated by the regionally-specific declines in manufacturing and ancillary employment. In response to these problems new debates and conjectures have emerged offering “solution packages” that purport to steer a route through the “extremes” of Keynesianism and neo-liberalism. These so-called Third Way movements, including Social Entrepreneurship, ignore the fact that mass unemployment is a systemic failure of the national economy to produce enough jobs and the fact that most governments are sovereign in their own currencies. Appropriate fiscal policy interventions can always generate enough jobs to match the needs and desires of the available labour supply. The failure of governments to pursue those options does not reflect any actual financial constraints on their capacity to spend but rather ideological choices to reduce their responsibility for providing sufficient work for all. In ignoring these facts, movements such as Social Entrepreneurship and microcredit adopt a characterisation of unemployment (and poverty) that rely on a mistaken view that government fiscal and monetary policy is impotent and that individuals have to be empowered with appropriate market-based incentives. Mass unemployment and poverty is always, in the first instance, a macroeconomic problem. The highlighting of local schemes or initiatives is worthwhile but fails to grasp the fact that in a constrained macroeconomy the scale of job creation required is beyond the capacity of local schemes or small-scale enterprises. This specific-to-general logic also pervades neo-liberal logic and formed the basis of the Keynesian attack on orthodoxy during the Great Depression. The infusion of the individualistic rhetoric (the creation of “micro enterprises”) throughout the public debate, driven by a blind acceptance of binding financial constraints on sovereign national governments has led these “solution packages” to lean firmly towards market solutions and maintain the notion of full employability rather than advance full employment in any meaningful way. The “rehabilitation” periods are all about “full employability” rather than full employment. By largely disregarding the macro-economy these solutions will fail to deliver full employment. As a consequence, the neo-liberal position is left unchallenged and is actually reinforced. Neo-liberal market-based solutions to poverty think that private resource allocation is more efficient and that entrepreneurial profits via full-blown business activities are required to cross-subsidise welfare provision, in an era where budget allocations are highly constrained. These concepts are heavily borrowed from neoclassical microeconomics. For example, efficiency appears in standard microeconomic text-books and refers to the highest output at the lowest cost. But even within this model (and it is not often emphasised) – while unfettered private markets allocate resources to the most efficient uses, the presence of any social (external) costs arising from private market transactions which are not valued in the market, will render private entrepreneurship inefficient. Social justice aims cannot be valued in the market and so private entrepreneurial models of welfare provision are unlikely to achieve efficiency. For example, how would a social entrepreneur allocate resources between profit-making and welfare-providing activities? Despite the use of text-book terminology to claim legitimacy for their agenda, no such authority exists in the microcredit (or SE movement). No neoclassical underpinning exists to suggest that these initiatives deliver welfare more efficiently than the Welfare State model they seek to replace. Markets fail to value social improvements and public goods and bads and benefits for people who cannot afford to pay. Accordingly, the market is not a legitimate benchmark to justify the changes from rights-based welfare. There are significant problems that arise from these proposals which claim that governments should not create employment but rather fund local social entrepreneurs and encourage entrepreneurial projects and facilitate commercial alliances between non-profit organisations and corporate businesses. First, it is unclear how adopting corporate aims to guide social spending advances social justice, which requires that resources are allocated according to an ordering of societal needs, determined in the public domain, rather than by corporations. Second, non-profit organisations who implement state welfare programs for commercial gain become co-opted (lose their independence) and may undergo fundamental internal changes. There are other objections that can be raised. From a practical perspective, these movements want the government to become a venture capital provider and underwrite small-scale capitalist production, which is known to have high rates of business failure. It is undesirable to make the fortunes of the disadvantaged at the behest of entrepreneurial vagaries. More significant community entrepreneurship would fail due to moral hazard (where the government takes on a moral obligation to prevent an entrepreneur from failing). The entrepreneur would face distorted risk and return choices because they can effectively ignore downside risks of any investment. Endemic market failure would result in a proliferation of wasteful investments. There is no problem of moral hazard in a government provided welfare model because allocations reflect political accountability. a sector of the economy which … functions as an employer of last resort … [and] … exhibited a high degree of shared social values … [or] … social cohesion, a characteristic of almost all societies in which unemployment has remained low for long periods of time. Social cohesion, here, refers to the willingness of citizens to allow the state to use macroeconomic policies to maintain full employment. However, a plethora of separate, entrepreneurial (competitive) communities are unlikely to develop shared values or social cohesion. Further, the substitution of community-developed, for bureaucratically determined, programs may introduce discord between sections of the community with divergent priorities, including intolerance of minorities. Finally, any positive outcomes of a small number of organisations will not automatically be transferable to every community. Microcredit entrepreneurs would compete with other private companies and employment generated in these communities may be partially or totally offset losses elsewhere in the private sector. In short there are numerous dangers in pursuing the community entrepreneurship model. Communities working together with the fiscal power of the federal government to achieve national goals would best ensure the protection of citizens’ rights originally secured by the introduction of the Welfare State, and, avert the possibility of divisiveness between and within communities. Poverty is not an individual issue. It is a societal issue. The microcredit approach suggests that individuals have to accept responsibility for their outcomes and be self-reliant. Unemployment is couched as a problem of welfare dependence rather than a deficiency of jobs. Microcredit attempts to break this welfare dependency by shifting responsibility from government to the individual. Modern Monetary Theory (MMT) shows us that it is a compositional fallacy to consider that the difference between getting a job and being unemployed is a matter of individual endeavour. In advanced nations, the adoption of welfare dependency as a lifestyle is different to an individual, who is powerless in the face of macroeconomic failure, seeking income support as a right of citizenry. There are now millions of people unemployed around the world as a result of the crisis. Millions more have been chronically unemployed in poorer nations. The major explanation for this pathology has been a deficiency of demand promoted by inappropriate fiscal and monetary policy. Governments reacted to the onset of inflation with restrictive policy stances summarised by a fetish for budget surpluses. In doing so, they have failed to understand the opportunities that they have as the issuer of the currency. MMT tells us that budget deficits are necessary to maintain full employment if the private sector is to pay taxes and has a positive desire to net save. In this regard, the orthodox treatment of the accounting relation termed the government budget constraint as an ex ante financial constraint is in error. Government spending is only constrained by what real goods and services are offered in return for it. There is no financing requirement. Debt issuance is seen as part of a reserve maintenance operation by the RBA consistent with their monetary policy cash rate targets. Accordingly, the alleged constraints on government action to restore full employment are based on false premises. The emergence of approaches such as microcredit as the costs of the neo-liberal failure have mounted can be shown to have been co-opted into the neo-liberal approach. In particular the disregard for the role of macroeconomic policy in restoring full employment and the individualisation of economic outcomes represent the major avenues through which the neo-liberal paradigm has absorbed the new so-called progressive agendas. The first part of the solution should be the introduction of a Job Guarantee which would see each sovereign government unconditionally offer a public sector job at the minimum wage to anyone willing and able to work. This immediately establishes and maintains a buffer stock of employed workers. This buffer stock expands (declines) when private sector activity declines (expands), much like today’s unemployed buffer stocks, but potentially with considerably more liquidity if properly maintained. The risks of the policy are all borne by the state rather than the individual. Within the Job Guarantee framework training and skill development opportunities could be afforded while the workers still received a socially-sustainable wage. Please read my blog – Employment guarantees in developing countries – for more discussion on this point. Policy agendas that focus on the individual when the overriding cause of the problem is macroeconomic (or system-wide) can never be progressive. The priority for progressives is to challenge the austerity approach which claims that the way to prosperity if less public and more private, despite there being no solid grounds for expecting the viability of increased private spending. While individual community endeavour might produce 100 jobs here and there via microcredit schemes – all of which are good and necessary – the reality is that millions of jobs are needed. Small-scale entrepreneurial ventures cannot ease a macroeconomic constraint on aggregate demand coming from an inadequate sized budget deficit. The ABC News reported that the – Spanish right celebrates landslide election win – and said it was the result of Spain’s voters venting “their rage on the ruling Socialists for the worst economic crisis in generations”. I can understand why the voters would want to severely punish the ruling government for mismanaging the crisis and failing to prepare a way for the country to exit the Euro. Spaniards voted in a grim mood against a background of soaring unemployment, cuts in public spending and a debt crisis that has put them in the front line of the eurozone’s fight for survival. The Official Data shows that national unemployment in Spain is currently 22.5 per cent and rising and youth unemployment is a staggering 45 per cent. The incoming right-wing government has promised “even harsher austerity measures to appease financial markets”. They will cut health and education spending (all areas which bear upon productivity growth and the potential growth rates) which will undermine prosperity for years to come. So expect unemployment to rise. Why would voters think it was sensible to sweep a party into power that will accelerate the impoverishment of millions. It demonstrates how poorly represented the electorates in the advanced world are – all parties are seized up with neo-liberal macroeconomic nonsense. This entry was posted in Economics, Job Guarantee. Bookmark the permalink.